Even Jaguar, a master of building premium performance cars for decades, has had to accept that downsizing engines has become an inescapable fact of life. The trick, of course, is not to fight the change but to embrace it. And here’s the outcome. The new XJ 3.0 V6 S/C is the first in the Jaguar line-up to get the all-new 3.0-litre, 335bhp V6 supercharged engine with stop/start, which has been developed from the V8. Also destined for XF and F-type (which also gets a 378bhp version), it replaces the 5.0-litre naturally aspirated V8 in the XJ, cutting CO2 emissions from 269g/km to 224g/km. Has the supercharged XJ lost its purr? In all of its many forms, the XJ has always been a blend of sporty dynamics and luxury, and the latest incarnation is probably the best example of that tradition yet. Jaguar has chosen to give the V6 a voice rather than opt for the near-silent approach that so many premium manufacturers favour these days, and even at idle the engine emits a satisfying purr. Like the rest of the range, the V6 comes with the ZF eight-speed automatic gearbox and the two work well together. Although giving away 40bhp to the outgoing V8, performance is still good thanks to a wide, flat torque curve. Response is instantaneous, building from a powerful, slugging mid range to a slingshot finish above 5000rpm. As the power floods in, the V6 soundtrack grows in magnitude, unobtrusive but mellifluous, compelling but never irksome, with just the merest hint of supercharger whine in the background. Whats the XJ like behind the wheel? 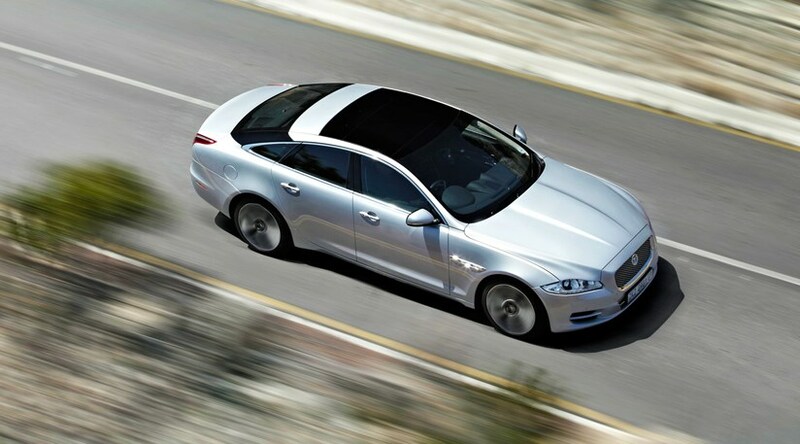 The subtlety of the steering response, poise and balance of the XJ is impressive. It’s so easy to drive, so completely planted, so confidence inspiring and beautifully engineered. Suspension has been slightly tweaked to account for the lower weight of the V6 engine and continues to showcase Jaguar’s knack of combining a smooth, supple ride with outstanding body control. The new package is topped off by a new 825W Meridian sound system which is standard on the two top models. But it’s the V6 engine that steals the limelight.